Develop an AppExchange strategy using your business requirements. Describe the key elements of the AppExchange home page. Describe the key elements of an AppExchange listing. List the ways you can try an AppExchange solution. In the last unit, you decided to look for a solution on AppExchange that can help you understand how Ursa Major’s sales team is using Salesforce. You also decided that browsing without a plan isn’t the most efficient way to track down that solution. So how do you find what you need? It’s actually easy when you get in touch with your inner AppExchange Superhero. Don’t worry, that doesn’t involve exposure to mysterious cosmic radiation. Rather, you learn how to develop a strategy for finding the best listing for your needs. Now crank up some inspiring music, because it’s time for your training montage. We admit that strategizing doesn’t sound heroic. But a little thinking up front goes a long way toward finding a listing that makes you and your users happy. To develop an AppExchange strategy, ask yourself these questions. Listing type—Are you looking for something that plugs into Salesforce without much fuss? If yes, a solution, like a Lightning component, is probably your best bet. Or do you want help building a custom solution for a complex business problem? In that case, a consulting service is the better fit. Functionality—What does the solution need to do? Which of these features are must-haves and which are nice-to-haves? Budget—Are you open to paying for the right solution, or does it need to be free? For paid listings, what is your preferred pricing model? AppExchange supports both onetime payments and subscriptions. Stakeholder needs—Who is using the solution? Make sure that you meet with these stakeholders to understand their needs, expectations, and timelines. Testing—Do you have somewhere you can test everything first? 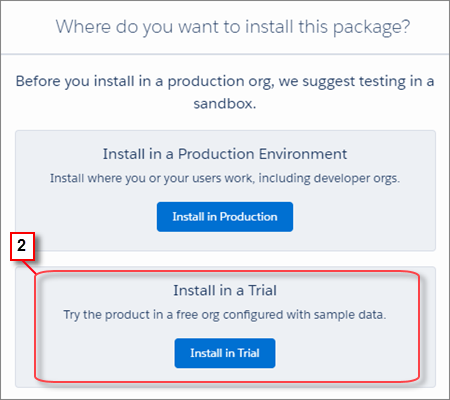 Before installing a solution in a production org, we always recommend testing in a Developer Edition org or a sandbox. Technical considerations—Does the solution need to be compatible with a specific Salesforce edition or feature? What about Lightning Experience or the Salesforce app? Think about what’s unique to your org, and take note of those items. Let’s compare all this against your requirements for Ursa Major. We can start with the big question: solution or consulting service? You have limited resources for this project, so you really prefer something that works out-of-the-box. That probably means some kind of solution, like an app. Now let’s look at the rest of the requirements. Functionality You need user adoption data, like who’s logging in most often. It’d also be nice to know which features they’re using, but that’s not essential. Stakeholder needs You definitely want to share the data that you gather with Ursa Major’s managers. They love visuals, so it would be great to show that data in a chart or graph. Testing You have a Developer Edition org that you use for trying out new features and doing Trailhead challenges. Technical considerations Compatible with Lightning Experience. Perfect, you’ve got a strategy. Off to AppExchange. You’ve arrived at the AppExchange home page. What now? The answer depends on whether you’ve come to AppExchange to browse, or if you’ve done a bit of strategizing ahead of time. In either case, let’s take a moment to get familiar with the key sections on the home page. Once we do that, it’s easy to see what’s next. 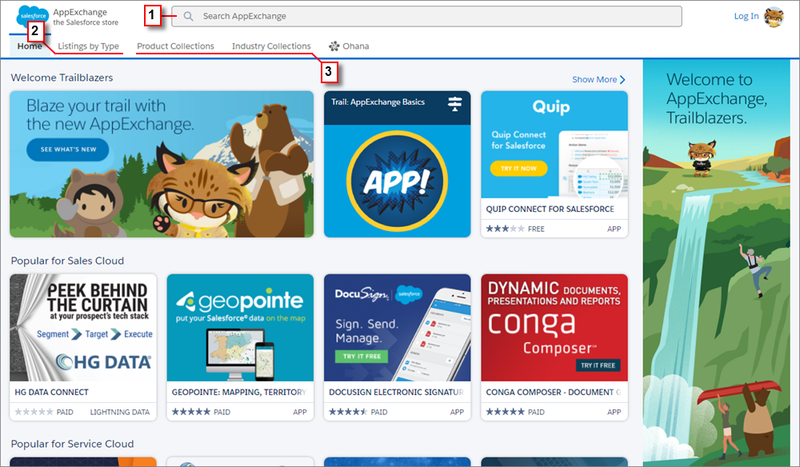 Search bar (1)—We don’t have to tell you how a search bar works, but if you’ve come to AppExchange with a strategy, search is your secret weapon. Just plug in keywords from your strategy and let AppExchange do the heavy lifting. Listings by Type (2)—If you’re in the mood to browse, the Listings by Type category lets you narrow your focus to specific types of solutions, like apps. Within a listing type, you can filter by price, rating, and other criteria to refine listings based on your requirements. Product and Industry Collections (3)—You learned in the last unit that collections are groups of listings curated by AppExchange experts, and they’re another great option when you feel like browsing. The Product Collections category organizes listings according to Salesforce product, like Service Cloud or Marketing Cloud. Likewise, the Industry Collections category lets you view listings by major industry, like Healthcare & Life Sciences. To summarize, head to the search bar if you’ve got an AppExchange strategy. If you’re not sure where to start, browse a collection or check out listings by type. No matter why you visit AppExchange, it’s worth taking a few seconds to log in. Logging in levels up your AppExchange experience by personalizing the home page for how you use Salesforce. After you log in, we show you listing suggestions from Appy, your expert guide to AppExchange. Appy’s suggestions are based on your role, the industry you work in, and other aspects of your Salesforce experience. The more you use AppExchange, the better the suggestions get. Appy’s suggestions are best when your community profile is up-to-date. To see your profile, visit the Trailblazer Community. Now let’s apply what you’ve learned to find a listing for Ursa Major. Because you developed an AppExchange strategy, search is the way to go. 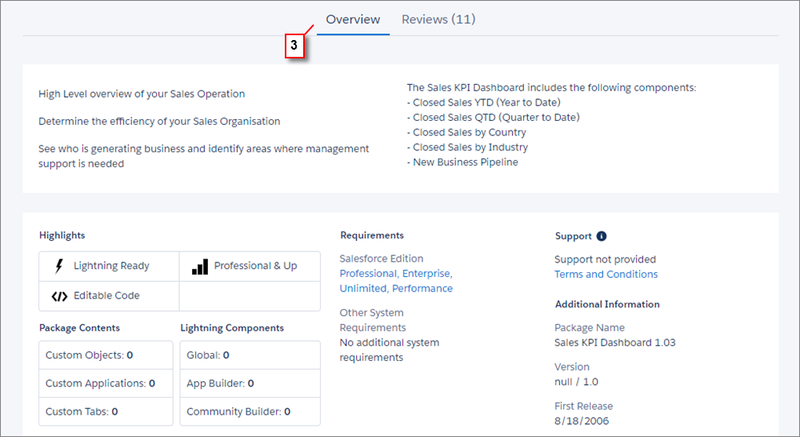 Thinking back to your requirements, you’re seeking a free solution that can help you track Salesforce adoption and is compatible with Lightning Experience. Your requirements provide some good keywords to work with, but “Salesforce adoption” is the key phrase. Let’s try searching with it. In a new browser tab, open the AppExchange website. In the upper right corner, click Log In. Enter your Salesforce login credentials and click Log In again. If prompted, allow AppExchange to access your basic information. In the search bar, enter Salesforce adoption, and then search AppExchange. With a simple search, you went from thousands of possible listings to a handful. Inspecting the top results, we see an app from Salesforce Labs that’s both free and highly rated. That could be a good fit! We can take a closer look at the listing soon, but first let’s see how AppExchange Superheroes approach listings in general. Listing summary section (1)—Provides images and videos, along with key listing details like price and average rating. Use the information in this section to decide whether to explore the listing further, or keep on browsing. Listing actions bar (2)—Lets you save the listing to the favorites list in your AppExchange profile, or learn more about it via demos and test drives. For solutions, the actions bar is also where you go to start the installation process. Overview tab (3)—Provides a longer description of the solution or service, the provider’s contact information, and links to documentation, such as case studies. For solutions, you can also view details about the package, including type and contents. We explore package types in the next unit. Reviews tab (4)—Displays ratings and feedback from Salesforce community members, including the top positive and critical reviews. After you try the listing, you’re welcome to add your voice to the conversation by posting a new review or responding to an existing one. 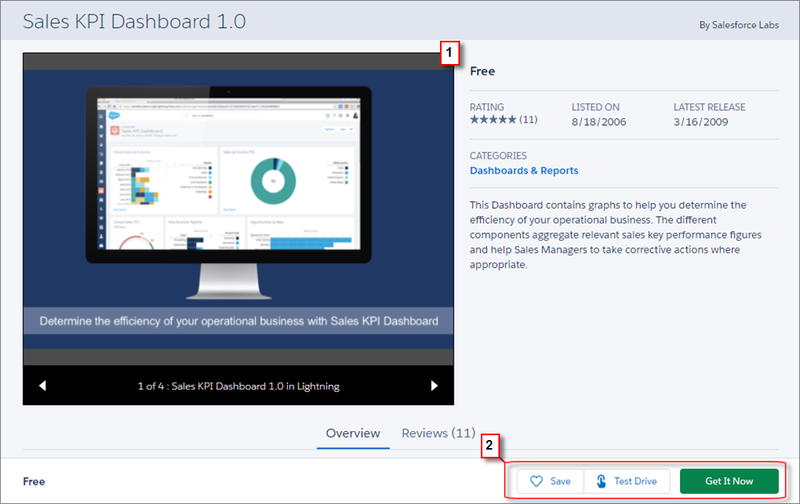 Now let’s return to the Salesforce Adoption Dashboards listing and check it against the requirements in your AppExchange strategy. How Does the Listing Stack Up? Budget Something free Looking at the listing summary, we see that it’s free. Off to a good start. Stakeholders’ needs Visuals that you can share with Ursa Major’s managers Elsewhere in the listing summary section, we see beautiful charts in the screenshots. Another win! Functionality Adoption data, like logins and feature use According to the listing description, the app shows user login history and trends, plus usage of sales-oriented objects like opportunities. Perfect! Technical considerations Lightning Experience support In the Highlights area on the Overview tab, we confirm that the app is Lightning Ready. Awesome, everything checks out! Of course, you’ll encounter situations where things don’t align so neatly. If that happens, revisit your AppExchange strategy and see if there are places where you can be flexible. Technical requirements, like org edition, aren’t easily changed. Instead, look for wiggle room in areas like functionality wish list or budget. Imagine that after viewing the Salesforce Adoption Dashboards listing, you still had questions about whether the app meets your needs. Or maybe everything looked great, but the app required Ursa Major to invest in a subscription. In these situations, AppExchange Superheroes look for an opportunity to try out the solution. On AppExchange, you have two options: a test drive or free trial. Test Drive—A test drive lets you experience the solution in a read-only Developer Edition org configured by the provider. You receive login credentials and can explore functionality in the org using sample data. If a test drive is available, it appears in the listing actions bar (1). Free Trial—A free trial lets you experience the solution in a writable Developer Edition org for a limited time period. Similar to a test drive, a free trial is configured with sample data. Unlike a test drive, you can customize the org and continue using it if you decide to buy. To see if a free trial is available, click Get It Now and look for the option to install in a trial org (2). Remember, it’s up to the provider to configure a test drive or free trial, so you might not be able to try every listing. If you can’t try something, or have questions that aren’t answered in the listing, we encourage you to contact the provider using the information on the Overview tab. Amazing work, you completed the training montage! Minus that awful 80s song in your head, it looks like you’re in great shape! In this unit, you learned how to define an AppExchange strategy by asking questions about your company’s technical and business requirements. You also learned how to navigate AppExchange’s home page and listings. Applying these skills to the situation at Ursa Major, you found the Salesforce Adoption Dashboards app, which can tell you more about how the sales team is using Sales Cloud. Now it’s off to your test org to learn how superheroes install AppExchange packages.